Using the right materials for your horse fence will ensure that your horses stay contained. 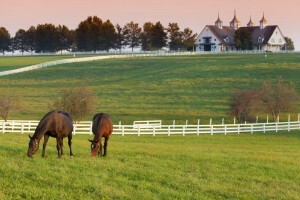 What exactly you need for horse fencing depends on a few factors. These are your budget, your practical needs, your aesthetic tastes, and overall maintenance requirements. When it comes to horse fencing, there is definitely no one-size-fits-all solution. Read on to learn more about everything you need to ultimately decide on the right type of horse fencing for you. Horse fences are generally five feet tall for pasture perimeters and may be 4 ½ feet for fences dividing any grazing areas. For Corrals, paddocks, and other such containment areas, fences generally need to be at eye level with a standing horse for optimal efficiency. Due to the number of concerns when it comes to horse fencing, many builders find that a combination of materials works best. Wood: While wood is the best looking and a sturdy natural material, it is also the most expensive and the most likely to be chewed on by horses. Vinyl and Vinyl Coated Wood: These materials offer the benefits of high visibility, easy maintenance, and they do not splinter or get damaged in the way that wood does. However, these fences are even more expensive than wood and require extra reinforcement to contain horses. Wire: This diverse material can be electric and is ideal for when you not only need to keep horses in but other animals out. This entry was posted on Friday, September 30th, 2016 at 1:47 pm. Both comments and pings are currently closed.